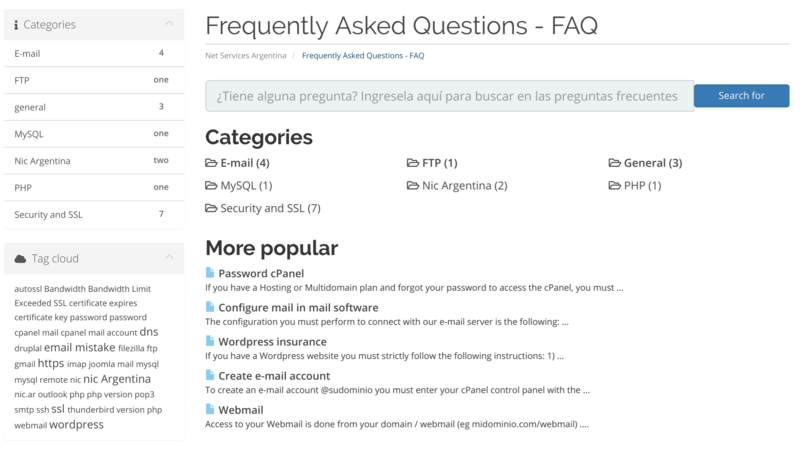 Net Services Argentina Review 2019: Is Net Services Argentina a Good Hosting? Net Services Argentina offers affordable SSD hosting for single or multiple domains. Its plans come with free SSL and an uptime guarantee. Net Services Argentina was founded in 2004. It provides shared SSD hosting, VPS, and reseller web hosting as well as domain registration services. Its servers are located in a data center in Dallas, Texas. Net Services Argentina’s website is in Spanish. The basic shared hosting plans come with a minimum 5 GB SSD storage, 30 GB monthly data transfer, 5 MySQL or MariaDB databases, and 5 email accounts. The most expensive shared plan increases the data allowance to unlimited bandwidth, unlimited SSD storage, unlimited databases, and 20 email accounts. If you want to host multiple websites, you can upgrade to one of the multi-domain hosting plans that allow hosting for 5-30 domains and feature 40-100 GB storage, 240-600 GB bandwidth, and unlimited databases and email accounts. The cPanel control panel with the Softaculous installer allows you to manage your hosting and install apps with over 400 scripts. Commonly installed apps include WordPress, Joomla, PrestaShop, and phpBB. Net Services Argentina’s hosting plans come at very affordable and competitive prices. Basic shared plans start at around half the cost of many major international hosting providers, for which you get enough SSD storage for a simple website. For unlimited SSD storage and bandwidth, the Unlimited plan costs around 25%-50% less than many national and international competitors. Hosting can be bought on different length terms: from six months to two years for the basic single-domain shared plans, and with an additional three-month option for the multi-domain plans. The multi-domain hosting plans cost roughly double the single domain shared plans. You get increasing discounts for increasing term lengths. An annual term is approximately 8% less expensive than a six-month term, and a 24-month term is about 14% cheaper. Net Services Argentina supports many more payment methods than most hosting providers. You can pay not only by credit/debit card but also in person at Pago Facil, Provincia Pagos, Red Link, Rapipago, Ripsa Payments, and Express Collection. Net Services Argentina provides shared SSD hosting, VPS, reseller hosting, and domain registration. Its affordable plans come with free SSL and a 99.9% uptime guarantee. Unfortunately, I was unable to contact the company. 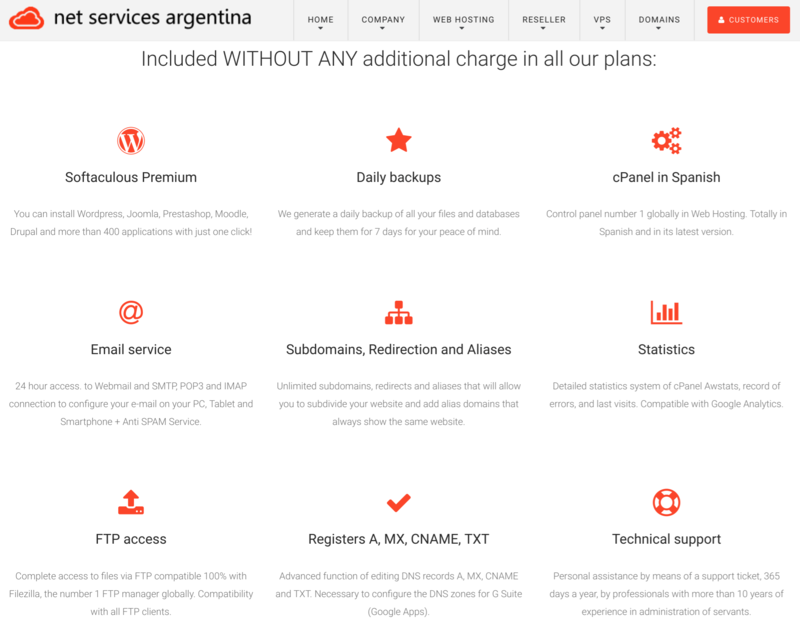 Wondering how Net Services Argentina stacks up against other Web Hosting companies? Enter any other Web Hosting company and we will give you a side-by-side comparison.